Many homeowners are choosing to have metal roofing put on their houses. As their roofing contractor, you need to help them make the right decision. Metal roofing comes in a variety of materials and also can be formed into panels or shingles. These are only some of the considerations that come into play when your customer chooses a new roof.There are a number of other factors to consider. There are a variety of materials that can be used to create a metal system. Some of those metals are: steel, tin, zinc, copper and lead. With each type of material, you need to know how to install it. Understanding installation procedures, starts with knowing the characteristics of each metal, and how it will react after it has been applied to a roof surface. 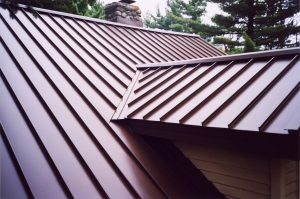 Slope is an important factor in choosing metal roofing because some forms of metal roofing are especially designed for a steep or low slope roof. Slope is calculated as rise over run. As you know, slope is important in calculating area. The formula is length X width X slope. Metal roofing comes in sheets and shingles that mimic a variety of materials. The tin roofs that were popular long ago do not resemble the style-savvy metal roofing of today. Your homeowners can find metal roofing that enhances their house and adds the esthetic appeal that they are seeking. Metal roofing ranges in cost from moderate to expensive. Almost all metal roofing costs more than asphalt. Steel is considered a moderately priced choice, where copper is seen as very expensive. Your clients need to know the difference in price of metal roofs to make a decision that’s right for them. Most roofers know how to install an asphalt roof system. However, many times this expertise does not extend to a metal roof system. With metal roofing systems becoming so popular, it’s important that you develop skills with this type of roof. Statistics say that a properly installed metal roof system can last forty years. An improperly installed roof system can create for you a world headaches and liability, which can wind you up in the middle of a court case. Metal roofing functions well in natural disasters. There were untrue rumors that metal roofing didn’t perform well in fire conditions. Quite the contrary is true. Metal roofs have good resistance to both fire and wind. Metal roofing is very eco-friendly. Some metal roofs are made of recycled materials. Most metal roofing materials can be recycled. Because these materials can be recycled, when a metal roof is torn down, those materials are preserved. Tons of them don’t wind up in a landfill like asphalt. Is Your Business Insurance Up-to-Date?